By now the pattern is clear. Every time there is a mass shooting, a bunch of nerds go to work creating fake Facebook pages for—and Photoshopped images of—the shooter. Some people are such losers they have nothing better to do than use the loss of innocent life and the horror of mass gun violence for politics. It’s disgusting and disturbing. It’s also entirely legal and generates huge internet traffic, which advertisers love, so it’s likely to get a lot worse before it gets any better. For some people, low-information nonsense like Infowars and 4-Chan is an addiction. They’ve just got to get their rage fix. Antifa, a leftist protest movement with no organizational hierarchy whatsoever, was blamed for the mass shooting in Las Vegas by Alex Jones’ conspiracy website Info Wars. They were responsible for allegedly plotting a civil war involving supersoldiers Saturday—one that utterly failed to manifest. 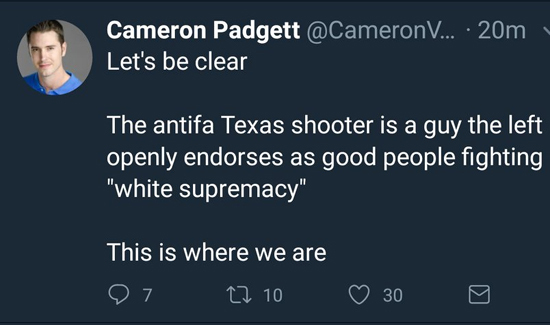 And on Sunday, after a man murdered at least 26 people in a Texas church, the right’s conspiracy peddlers waited only a matter of hours to try to blame the violence on leftists. Jack Posobiec, a pro-Trump figure with a large following on social media, who has a reputation for creating and pushing fake news stories about leftists, posted a screen shot of something that looked like a direct message conversation on Twitter. The conversation was between a man named Dave Pollack and It’s Going Down (IGD), a self-described “digital community center for anarchist, anti-fascist, autonomous anti-capitalist and anti-colonial movements” frequently associated with “antifa” protests. Candid commentary. I agree. There are more of us private citizens though, who read 4chan or, God forbid, 8chan, who support LEO’s (at least I’m one, and believe I can speak for others I know based on IRC conversations). Conspiracy theories are often ridiculous and hurtful. Being from Connecticut, I was surprised to find a music teacher I happen to know from the Newtown area being called (on about say 5 or more YouTube videos) a ‘crisis actor’ supposedly the ‘same’ as 3 other women interviewed by news around times of shootings or similar crimes…yadda yadda. The people who believe stuff like this bite your head off and call you a ‘paid government shill’ even if you have absolutely job, when you go to defend against their actual disinformation. We’re just in a time, now, where communications have become very rapid, lower and lower in quality, and the very nature of our information technology seems to inflame the stupidity of people, when used for such purposes on a mass scale. Cheers.